In the summer of 1972, I was doing what I did every summer around then, which was to spend a few glorious weeks at a cottage my family rented around Lake of Bays, in the Muskoka district of Ontario. At the time I was 14 years old, and interested in jumping spiders, along with my brother Wayne. But then one fateful day I found a beetle on the wood siding of the cottage, just to the left of the sunporch door. The wood siding was a dark reddish color, and the trim around it was white. The beetle was vivid against the dark red. It was the most beautiful beetle I had ever seen, and I with a shaking hand quickly grabbed it. I didn’t know much about it at the time, but eventually I learned that it was a Buprestis, possibly Buprestis aurulenta (I haven’t tried to identify it, but I do know it is close to that species, at least). That beetle is the oldest specimen I have in my collection. Sometime during my teenage years the beetle fell apart, and the elytra became detached. Even though it is now in pieces, it is still one of my treasures, because of my memory of the awe I felt in seeing its beauty as it rested on the side of the cottage. 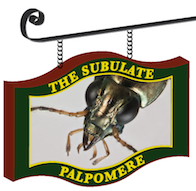 I’m not sure if that beetle played a role in my becoming a coleopterist, but it wouldn’t surprise me if it did. It was about a year later that I started collecting beetles in earnest. On Saturday I was near a small tributary of the Winchuck River in southwestern Oregon. I was on a delightful trip with my mother; we were exploring northern California and southwestern Oregon, seeing the sights, collecting beetles, eating good food, and staying in nice places. The Winchuck River stop was one of our lunch & collecting spots, along a gravel road in a beautiful forest. There, beside the road, was a little patch of daisies. 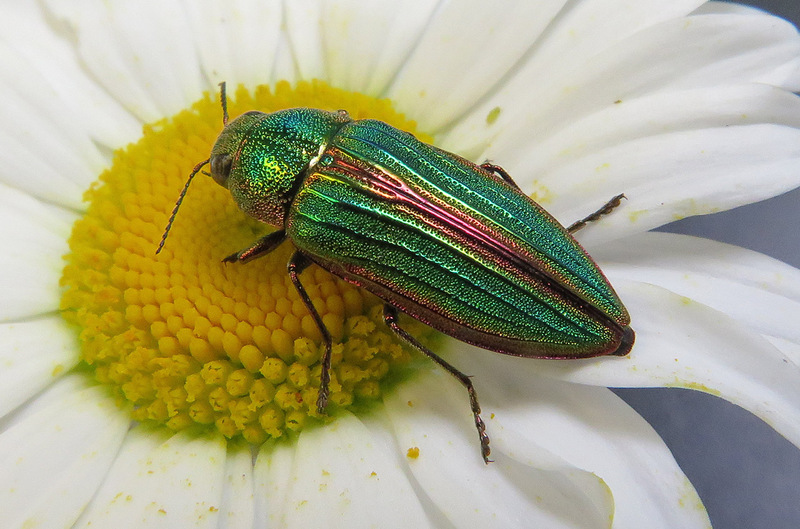 On one of the daisies was the Buprestis pictured below. It was the first time I had seen a Buprestis like this alive since that day in 1972, and I must say my thrill at seeing one in 2014 was almost as great. They are wonderful animals. This entry was posted in Fieldwork. Bookmark the permalink. Nice! They are one of my faves as well! Such a gorgeous creature. I think shiny insects like these and chrysidids are what put me in awe of insects too. I agree; there is nothing like a shiny beetle to grab ones attention, not to mention turn them into an “addict” for bug collecting, ect. I have seen a very similar buprestid (probably the same species) on my travels throughout Pacific Northwest, and have many in my collection. They are one of the first beetles I put under the scope to WOW! kids and adults alike. When I was a graduate student many years ago I helped finance my expenses by working as a carpenter for a contractor who built big new houses in the San Juan Islands. One of the best place to collected buprestids and cerambycids is at knew home construction sites. They appear to be attracted from long-distances to the pitch smell of new cut lumber (most of them probably have very high dispersal power). I suppose lumber yards and sawmill are also good places to collect them for the same reason.